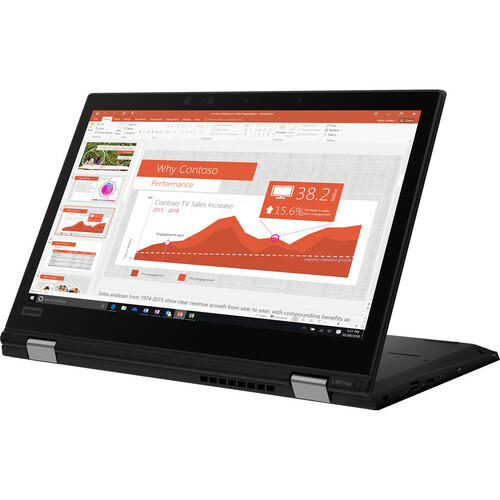 The black 13.3" ThinkPad L390 Yoga Multi-Touch 2-in-1 Laptop from Lenovo is designed for business purposes, featuring the performance, security, and portability users need. Specs-wise, it's powered by a 1.6 GHz Intel Core i5-8265U quad-core processor, 8GB of DDR4 RAM, and a 256GB M.2 PCIe NVMe Opal2 SSD. Should you need more room, you can attach external storage solutions using its USB 3.1 Gen 1 ports, as well as quickly offload data to other devices with its microSD card reader. Box Dimensions (LxWxH) 18.5 x 11.9 x 3.2"